them go down but one goes up. They’ll talk about the one that goes up. They never talk about the ones that go down. In the end, they also buy those NASDAQ stocks and the whole thing collapses. “Then they go again to cocktail parties and then they see the neighbor’s house appreciating by 20% per annum. Finally, they can’t resist. They buy homes in 2005, 2006 but since they lost their money on NASDAQ they have to borrow 100% on the homes. The Feds tell them that home prices will never go down and don’t forget Ms. Janet Yellen, she was the president of the San Francisco Fed from 2005 to 2010. The San Francisco Fed is responsible for Arizona, Nevada and California, the three biggest housing bubbles in the whole country. 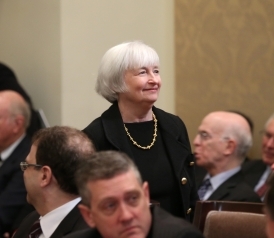 Thank you very much Ms. Yellen. You’re now in charge of the whole US. You can create other bubbles.